Breaking Bad hit Comic-Con in a big way yesterday, with creator Vince Gilligan joining former cast mates Aaron Paul and Bryan Cranston for some San Diego fun. No, there was no blue meth involved. But it was pretty special, as far as Comic-Con events go. 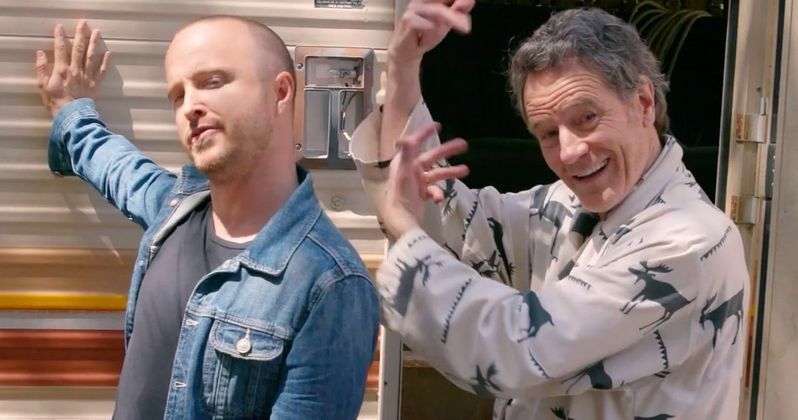 Earlier in the week, Breaking Bad fans were treated to a special Omaze video that reunited cast members Aaron Paul and Bryan Cranston for a good cause. Fans who donated to a couple of different charities were given the opportunity to win a morning cookout session with the pair who used to play Jesse Pinkman and Walter White. The guys were back up to their old tricks at the convention center yesterday, as they tag-teamed Hall H in grand fashion. Joining Gilligan, Cranston and Paul were co-stars Anna Gunn (Skylar White), Dean Norris (Hank Schrader), Betsy Brandt (Marie Schrader), R.J. Mitte (Walt Jr.), Bob Odenkirk (Saul Goodman) and Giancarlo Esposito (Gus Fring). Bryan Cranston talked a little bit about the anonymity of the show during its first couple of seasons. "Nobody knew who we were. I knew we started to make an impact when the directional signs started to be stolen,. I kept thinking, 'Not only am I getting lost, but something is happening.'" Vince Gilligan commented about the awards the show racked up, and went onto refer to Bryan Cranston's first Emmy win as an almost spiritual experience. "I'm thinking there's no way he's going to win. Just because it was only seven episodes. And they said 'Bryan Cranston.' All the air went out of my lungs. I hit my hands together so hard, as soon as I got home I had to put them in ice water." Better Call Saul, the Breaking Bad spin-off that has proven itself worthy of its predecessor, is coming back later this summer. And the question on everyone's minds is whether or not Walt and Jesse will be back. Gilligan has already confirmed that Season 4 will tie into Breaking Bad as it begins to intersect with that timeline. About their return, Vince Gilligan offered this. "I think there's an excellent chance of any and all these folks showing up. [But] you will not see Walt or Jesse in season four of Better Call Saul, and not to be a downer, but we hate jerking folks around." The creator of both hit shows went onto tease that both Walt and Jesse would probably show up before Better Call Saul comes to an end. The Breaking Bad reunion was followed by a panel for Better Call Saul, which brought Bob Odenkirk in for the Breaking Bad reunion as well as pimping out his own show. Odenkirk really wants Dean Norris' Hank to show up. He explained that it was revealed early on in Breaking Bad that Hank and Jimmy knew each other and didn't like each other. ""Something bad happened. Let's find out what it is." The Breaking Bad reunion panel came to a close when a fan asked if a movie was possible. Bryan Cranston shot down the notion quickly, but Vince Gilligan was optimistic. "I love that question. Anything is possible. We live in a world fraught with possibilities." However this franchise continues, we're sure to see Walt and Jesse together on screen again. It's inevitable.